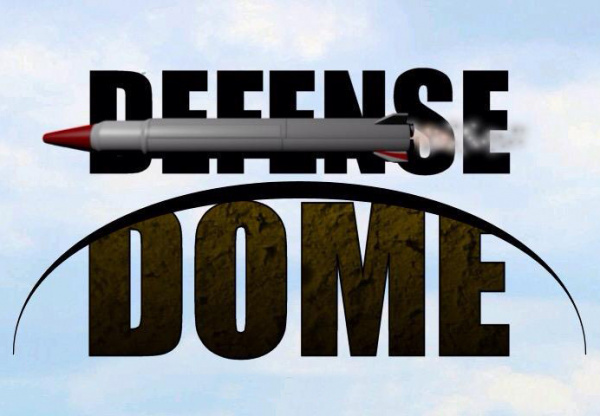 Defense Dome is a classic-style arcade action game developed by the aptly named HullBreach Studios for the Wii U eShop. Designed to be played in short bursts, this game offers quick access to three separate level designs, with promise for more content to be made available as add-on content. It is refreshing to see that indie titles are able to utilize the GamePad (the second screen and gyroscope are the primary controls within the game); the player is tasked with having to shoot down a flurry of missiles using the GamePad as a magnified field of view and cannon reticle. First, let's break down the three different levels. The level that should be your first option is Mountains (Tutorial mode). This is endless and gives you a chance to ready your battlestations - with a constant barrage of missiles flying in from the right you get a quick lesson in calibration, and then the rest of it is in your hands, literally and figuratively. Second level is Hurricane (Blitz mode), which is exactly as it sounds. 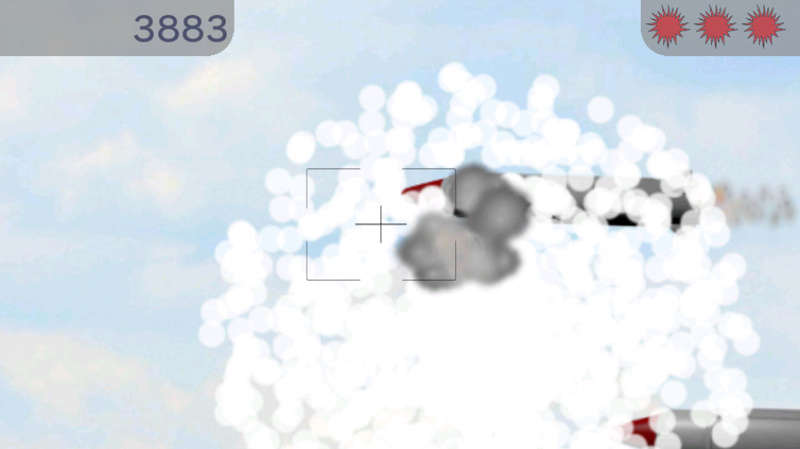 The player is given a set amount of time and, during a storm (why someone would choose to fire missiles during a Category 1 hurricane is beyond us), is tasked with shooting down as many missiles as possible. The last available level is Port Town (Endurance mode). The implied objective is to save the port town from the onslaught of rockets that, again, fly in from the right side of the screen. A percentage is displayed in the bottom left (the health indicator of the town), and it drops down for every missile that you let through. Unfortunately, that is all. Now, the game is touted as a classic arcade game, so a bevy of options should not be expected. What should be expected, however, is some variety within those game modes. What starts out as an interesting concept quickly devolves into a boring and repetitive motion - minimal variety to locations, backgrounds, or difficulties. At least the game offers up continual gameplay, which cannot be said towards any sort of worthwhile audio. The title screen plays a metal-themed short loop with heavy percussion, the level select switches jarringly to a classical piano musical loop (this one is also quite short). When the music is played on such a short loop it quickly becomes grating and, unfortunately, annoying. Once starting an actual level you are instantly relieved of all music, as there is none. There are some sound effects here and there (not even every time you hit a missile with your gun will you hear an explosion sound), but mostly just silence. It's unnerving, and it feels like playing an old game that has a broken audio file, or one of your stereo cables have come loose. One could hope that the visuals could help carry the game a little bit further, but they're extremely sparse. 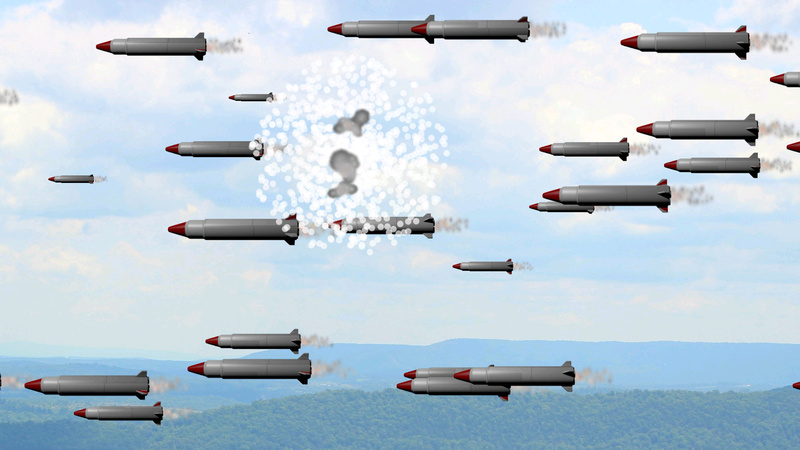 Backgrounds are insignificant and scroll slowly, there is no variety to the missiles that are coming across the screen (save for the missiles that require two hits), and the player is looking at mostly white or grey blank screens. Since the GamePad is used to zoom in on what is displayed on the TV you see even fewer missiles, and it seems even more bland on the smaller screen. Finally, the controls are sadly frustrating. It was at this point that anything would have improved the game from its lacking visuals and audio, but trying to get through a single-level is a tedious task. It should be said that HullBreach should be commended for its attempted use of the GamePad; the idea doesn't feel gimmicky, and the whole game revolves around this unique play style. Using the gyroscope, you aim your gun through the centre of the GamePad; you can then move it around on the TV and get a closer look at your targets and use the triggers to fire your cannons. Sadly, after a few whips back and forth trying to find and shoot down rogue missiles, your viewing area is no longer calibrated correctly. The gyroscope in the Wii U either isn't strong enough, or the game doesn't handle the motions very well. Either way you're left pressing the minus button several times throughout a mission to recalibrate and bring the reticle back to the centre of the screen. We hope that not a lot of the military's budget went into this cannon, because it seems to be rather defective. 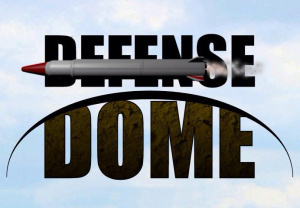 Not much else can be said about Defense Dome, but that is only because there is not much to say. A small, barebones game that quickly loses its audience due to a lack of engagement and repetitive actions. Although it comes with a small price tag it still doesn't feel like a worthwhile purchase. Here's hoping the add-on content that is planned by HullBreach will add some much needed colour and variety to the game, but as it stands it misses the mark. Not sure why Hullbreach even bothered with this one. Sounds like an updated version of 1980's classic Missile Command... only far less fun and entertaining. Might have to dust off the 2600 later. @ajcismo That's what I was thinking. 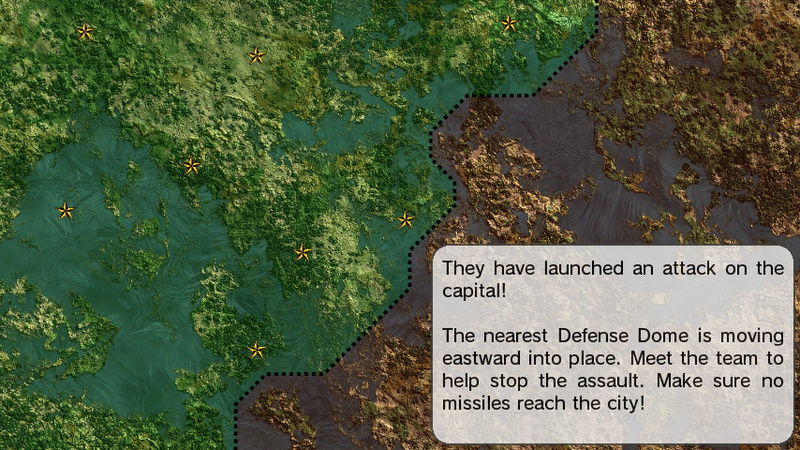 Do you know if anybody has ever made an HD updated Missile Command? Playstation Network seems like a logical place, seen a lot of other classics remade there, not always for the better. Though I suppose it would never be the same without the trackball. Had to look that up on Wiki, looks like the XBox360 got an HD remake back in 2007. Seems there was a Jaguar version back in the 90s too. It just doesn't seem the same without a trackball pinching your fingers though. @TromboneGamer Not sure why Hullbreach even bother at all! @ajcismo Thanks for going thru all that trouble. Never had an Xbox, or a Jaguar. Now I want one. An HD Misslie Command, not an old console. Seems like it would be a natural fit in COD as a minigame, those type of graphics. Not as good as the actual real life Iron Dome then. My pleasure, I was curious myself. We're probably among only a few N-life members who remember playing the original version in its trackball glory. @ajcismo Well I remember playing it in arcades b/c no matter how hard I tried I always sucked at it. Xevious, Gyruss, Q-Bert and Phoenix were my games.